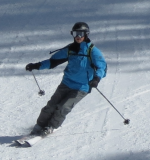 On Friday, Jan. 6, I did our local demo day at Elk Mountain. Conditions were great considering the lack of snow this year, but, as the day wore, the surface reverted to some very hard, old, over-skied, crusty eastern snow. It was a day for carvers and below is a quick review of 3. On all, I took one run down a cruiser, then, a second down a black that was very slick to ski. On the second run, I could not get carving angles and did a lot of slipping. In truth from riding the chair that runs above the run, damn few could get RR tracks. To Lynn and Jim, you missed a great spring skiing day - full sun and 40's! Next year, come back! Elan Waveflex 12 - 168 cm. This is the dual fore-tip design. A dedicated inside edge is traditional; the outside has a very slight rise. Frankly, I don't get the design. The Elan rep states there is no good reason to ski the outside edge. My preference would always have two edges to get greater life out of a tune. That aside, wow, this is a short radius carving machine! Sure made me smile from the first turn. Not as demanding as a traditional Sl ski, just great grip. Easy turn initiation, stable and fun. No need to apply any rotary forces. Not an all mountain ski, at the narrow radius, it only appeals to a few. Easily a future replacement for my Supershape's on performance alone, but with only one ski-able edge, not sure I would not make a buy. Fisher's detuned version of the full race Sl ski. Another candidate as a SS replacement or for PMTS enthusiasts. Great edge grip, stable at speed, slightly more demanding for good technique than the Elan Waveflex 12 or a SS. The forces generated in skiing a Sl put some demands on the body, not sure I'd want to ski it all day. Not quite as much fun and the Waveflex or SS, but, I would love a full day on one to get better acquainted. Little brother to my Kastle MX88's; not as beefy, easier to turn, fun. Per the rep, this is Kastle's detuned GS ski. All the great Kastle qualities are here, very smooth, quiet, good grip, vibration-free, stable, a pleasure to ski. Great for an eastern skier who wants a higher speed performance and longer turning radius. I could ski it all day very easily, but, I don't value a GS type ski. If I'm going to spend the $$$$ for a Kastle, I'd go in other directions. Note: did some editing to correct punctuation as my MS Word apostrophes become question marks here. Hey Mike, thanks for the reviews. Sounds like you had a great day. You hit on a couple of skis that I have been checking out for my wife as possible replacements for her SS Speeds. Kastle....does this ski have the dual radius sidecut like the MX78? How did it handle snappy short turns? Was it more of a GS-only feel? Or did they feel agile, light and quick, or were they heavier, more solid and measured in their handling? Elan....when you pressured the inside (uphill) ski, how did the ski respond wrt. edge hold? Any loss of grip, slipping? I'm particularly curious about that aspect, as my wife uses the inside ski very actively for all of her carved turns (I think it's her ice skating background), and that Amphibio design has me thinking that there might not be the same solid edge hold on the inside edge as a regular camber ski. Any comments? (BTW, the women's version of this ski won Ski of the Year at Realskiers review site -- scored all 5's....remarkable). I checked out the Elan at a shop in Vancouver recently, and the rockered portion of the ski's tip is really not all that pronounced. It's only rockered about 1.5 or 2 inches back from where the cambered edges touch each other, when the bases are squeezed flat together. And it only just a gentle rocker; maybe a few millimeters offset. Interesting design.... I can't imagine that little bit of rocker causing a major loss of edge grip, but it would be good to get your feedback. Nice Mike...sounds like it was a fun day.. I too want to give that Elan a test drive...I've heard very good things about it! The ski I wanted to demo is the Elan Amphibio WF 12....is that the ski you tested Mike? I demo'd the Elan amphibio Wave Flex 12 Fusion. How's that for the longest name? Below is link. 14 m turning radius. So, yes, Gary, I'm 99.9% certain we are talking about the same ski. 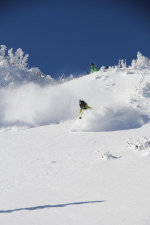 Your observations about the small amount of rocker, in tip of the outside ski, are accurate. I could not detect any difference in the way it performed because of that distinction. I probably do not use the same technique as your wife (we could have a lot of fun with that statement, and, we are talking skis here.) More than anything, I remember the grip of the weighted ski using my PMTS one weighted ski style. It's just a fun ski, had me smiling. I only did two runs as a favor to the rep because he had someone else who wanted it. Given more time, I would have reversed the skis, just to see what happened. Nice, light, quick, stable. I rode a chairlift today with someone who had the ski, and, he gave it great reviews on our eastern home mountain. I am a fan of Elan carvers. The Kastle MX70 is agile, very smooth edge to edge, but, compared to the Elan, it's more of a GS ski. I think it would make a great ski for an high speed lady, it was not bulky. I did not try to make shorter turns as the rep stated it was GS and I wanted to experience the GS qualities. I did not demo the MX78 again, it was getting to much usage from others, that day. On a small eastern mountain, for me, the Elan wins hands down, but, I prefer shorter radius skis to develop PMTS. I've joined a local ski racing team and would consider a MX70, but, as it would be a speciality ski, the cost/value ratio does not work. If your running a Nastar style course for your league a Womens WC GS skis is IMO your only option. Straighter skis go faster. The thought of getting a GS ski has been running around my mind, and, I've seen some great values in the used market. Why a woman's? I think I'd prefer a smaller turn radius, but, are they not available in men's? Hmmm, what length/radius would you recommend ? Mike, thanks for the feedback on those skis. The Elan sounds like a winner. My brother has the previous version of that ski, the Speedwave/Waveflex 12, non-Amphibio version, and loves it. Tons of fun. I hope to steal it from him for a day later this month, and will see what all the fuss is about. I think the Kastle is definitely worth a demo too. FYI, I checked the Kastle site, and the MX70 is also a dual radius ski, so short turn performance should be there too. They have them at a shop in Banff, so she may get out on a pair in a couple of months. So far her short list is: Elan WF-12; Kastle MX70; Stockli Laser SC; Nordica Spitfire; and Fischer Progressor 10. At present she is inclined toward the Fischer, as she is having such a blast on her Progressor 8's. Comment from her: "Make it a bit longer and a bit more solid, and I'm sold!" That pretty much sums up the P-10. I did check out their website and no mention of the sale that I could find. Come on man, are you crazy! GS skis and racing for you? I've come back to planet Earth and will no longer pursue high speed skis. No crashes permitted, and, it's in keeping with my ski mantra "make good decisions"
can I have an AMEN brother Mike! Does this mean goodbye to the Mack Truck Ski Racing Club? Just the name alone elicits visions of huge linebacker-size guys in studded leather ski jackets with life-size bulldogs emblazoned on the back, hurtling down the runs at suicidal speeds, bashing down everything that gets in their way, including small children and large trees. Mike, I've never met you, but from your calm, thoughtful and reasoned words on the forum, the two pictures just don't match. Here's to sanity! And to FUN! I am an official member of the Mack Ski Club, but I will not get the tatoo. They refer to the group as the "Whack Ski Club" and for good reason - not sure if that work is used in Canada. My first race (read Nastar is Sunday) and the Blizzard Mag Sl's are waxed and brushed. I can hear the wheels in Helluva's brain saying "Come on Man!" but, he's not saying to go faster! I don't have Bode's gonads. The real highlight is the apre-ski at a local watering hole following the race - one place I can keep up! As to finally meeting, its looking positive for joining G's group at Holimount later this month. I would be great to meet you and do some turns. Awesome. Ski well and quickly. Whack is a word used here often. Usually in imitation of Jersey mob guys. Gee, Mike....if you belong to a ski club with that name, I'd better give you more respect, or else watch my back at Holimont. I wonder how much Kevlar weighs.....? Good luck in the race tomorrow! Jim, Lynn -- how's the skiing in Utah? Are you still there?